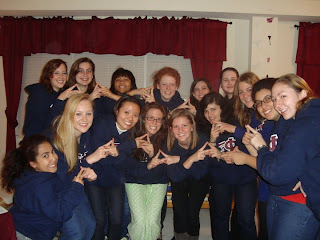 Home Blog Lambda Chapter’s Fall Success! 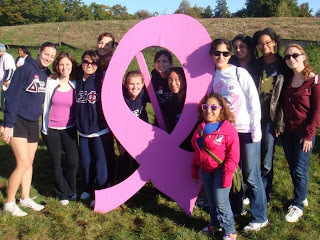 With our goal of “upward momentum,” Delta Xi Phi’s Lambda Chapter has been busy this year! We have been getting more involved and organized every year, so in 2011 we hoped to exceed expectations in all areas... and we did! To start, all of our Executive Board and Associate Member Educators attended DXP’s National Convention, along with other sisters who were not required to attend. We made the most of our summer not only by attending Convention, but also by doing two things we’ve never done before: planning recruitment completely over the summer and organizing an event for the Johns Hopkins University Orientation! We started off the year strong by giving our sisters free DXP pens and folders with materials geared towards each committee. We also started many other new initiatives such as a weekly “Snaps Jar,” “DXP Sister of the Month,” monthly lunch potluck meetings, and DXP crossword puzzle to remind active sisters of the information they learned as associate members, as well as a monthly calendar of events. We also voted on budget/dues proposals as a chapter for the first time in Lambda’s history. In terms of committees, we have been stressing the importance of remembering every single committee and pillar this year. No committee or pillar should be any less important than the others. Our historian and web-mistress started a DXP Photobucket account for sisters to share photos more easily. We are also making a slideshow for the ‘Fall Formal’ this year. Our fundraising committee began the online survey and MyEdu fundraisers again. We’ve also applied for grants and earned money by winning the Second Decade Society Scavenger Hunt. Lastly, we raised money for the American Cancer Society – DXP’s national philanthropy – through two awareness/fundraising booths and we planned our fundraising efforts for Intersession (the 3-week period after winter break) and the spring! Publicity has also been very active this year, and we are definitely getting our name recognized on campus more than ever. 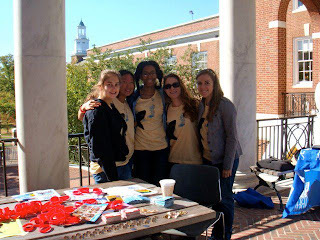 We sponsored an event for Johns Hopkins orientation, which landed “Delta Xi Phi” on the schedules and shirts that were worn around campus and seen by freshmen. We ordered nice chapter recruitment postcards, painted a mural board, made a banner for the Breezeway, and put fliers all around campus (in the mailboxes and in the dorms)! We raised so much awareness that when we participated in the Student Activities Fair, many girls were coming over to our table peaked with interest. After recruitment was finished, we continued publicizing through co-sponsorships. We’ve co-sponsored with Thoroughfare Magazine by hosting a ‘Poetry Night,’ with CHAI by hosting an awareness event for Gilad Shalit, with Greek Life by running ‘Penny Wars’ for Greek Weekend, and are currently working on a co-sponsorship with Global Dental Brigades. These were ways we worked to raise awareness, but we also did many other things. We have cultural presentations at every meeting, and many of our sisters attend awareness events together. For example, “Identity: Transgendered,” “Culture Show,” and the “Cultural Block Party” are all events that sisters attended together, volunteered for, or performed for. Although raising awareness is one form of philanthropy, we didn’t stop there! We’ve been donating tons of DXP blood to blood drives, aided in Patterson’s High School Fair, wrote letters to a battered women’s shelter for a service-based recruitment event, had a team for the President’s Day of Service (which also landed us on the website and pamphlets as sponsors), volunteered for and participated in Towson’s 5K for Prostate Cancer, set up a team for the Breast Cancer Walk, wrote letters in honor of Fallen Firefighter’s Weekend, and helped aKDPhi run Breastival. It sounds like a lot, but believe me, we’re not done! To finish up external committees, we’ve been entering the Greek community with full force this year. We participated in every single event for Greek Weekend. 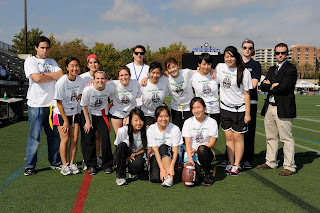 We organized a Powderpuff team with SOPi. The fraternity Sigma Chi even coached our team! Since then, we’ve had a mixer with aKPhi, and held another mixer with SOPi and Sigma Chi. Greek relations have never been so strong, and we know it will only get better with time. Our internal committees have also been working hard this year! We started planning recruitment over the summer, purchased DXP magnets, postcards, and wallet calendars to give to all prospectives, and publicized a lot. As we had hoped, it really paid off! We saw over 20 new girls throughout recruitment (probably a record for us!). We organized a powerpoint for our information session, ordered recruitment t-shirts, line jackets, and nice invites for events! We had one of the biggest fall lines we’ve had in years and although many hardships in the process have arisen, we have handled everything with care and passion. The social committee has been equally as diligent. We decided on a schedule for socials by the end of September! 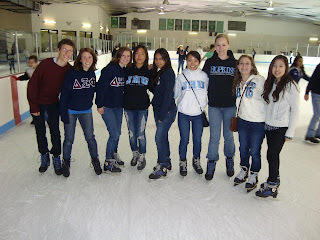 Since then, we went ice skating, painted pottery, held a sister retreat, went to the Inner Harbor, and organized a “Smores and Secret Santa” event. Fall Formal is also going to be a special, catered formal event this year, which is a new type of event for Lambda. Academically, we’ve began “Word of the Week” with bookmarks as gifts for those sisters who can correctly guess the meaning of the word. The Alumnae Committee has created a database of alumnae information, a Lambda Alumnae google group, and sent 1-2 newsletters a month. Three to four alumnae attended events this year, which was lovely! This school year has been amazing so far, and it is only half-way done! We’ve been featured in our campus newsletter, sent all paperwork to Nationals on time, and have been raising the bar in all areas. We have so many more ideas for the spring and cannot wait to see our goals reached. We are very proud of where Lambda is right now and only hope that we keep improving every year!